Elizabeth Walsh, Visiting Assistant Professor at University of Colorado, Denver, shares the story of the Denver-Boulder hub. James Edwards and Hunter Lovins of Natural Capital Solutions contributed to this piece. In 1893, from the top of Pike’s Peak in the Rocky Mountains of Colorado, Katherine Lee Bates looked upon the land with awe. What Bates could not see was how much the land before her had recently transformed. As economist Winona LaDuke explains: “For thousands of years, the Great Plains, the largest single ecosystem in North America, was maintained by the buffalo. By their sheer numbers, weight, and behavior, they cultivated the prairie.” Beyond their role in ongoing regeneration of an exceptionally diverse prairie ecosystem, the great herds of bison were the primary source of material and cultural wealth for First Nations of the Great Plains. When prospectors discovered gold in Colorado in June 1858, over 100,000 gold-seekers traveled west. White squatters, supported by federal armies and expansionist policies, stole the land from indigenous people. In thirty years they transformed the region to a new vision: systematically, they hunted the bison to near extinction, transforming the once communal prairie hunting grounds into private farms and cattle ranches. Virtually all of the native tribes in the Colorado Territory were forcibly removed. 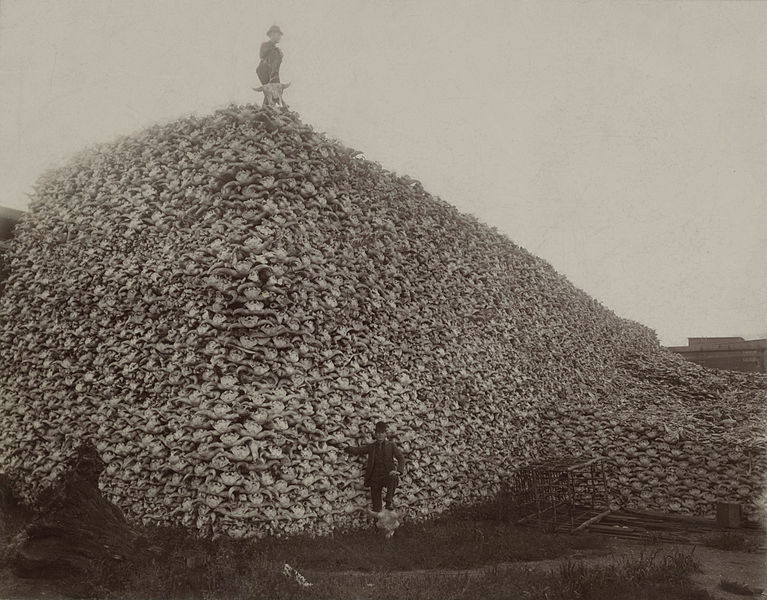 Photograph from the mid-1870s of a pile of American bison skulls waiting to be ground for fertilizer. ​Retrieved from the Library of Congress, https://www.loc.gov/item/2002628195/. ​The growth of the new extractive economy afforded wealth to the settlers. The Transcontinental Railroad and the Homestead Act created access to opportunities for immigrants, newly freed African Americans, and women, all of whom settled in the Front Range to enjoy economic opportunity as well as the beauty, vitality, and ecosystem services provided for “free” by the bioregion. Today, the region is a sprawling metropolis of over 3 million, one of the fastest growing areas in the U.S. Yet, social and ecological costs from Colorado’s extractive modes of economic development remain. Toxic tailings from mines have polluted waterways and forests. Fracking threatens drinking water for communities. Denver and Boulder grow in population but access to healthy food, water, and other ecosystem services is inequitably shaped by racism and classism. Gentrification forces the suburbanization of poverty, which sustains sprawl while transferring financial and ecological burdens to those with the least resources. Conventional agricultural practices are still fuel- and water-intensive. Despite this, the transition to a regenerative economy has begun. Remnants of extractive industries—mining, oil, gas, and soil-depleting agriculture that fueled historic growth—remain, but services, clean energy, technology, outdoor industries, natural foods, cannabis, education, and startups dominate. The growth of the “creative class” sectors and a robust tourism industry underpin economic prosperity. Urban regeneration efforts such as Denver’s Sun Valley Eco-District show that development doesn’t need to mean displacement, and prosperity can be equitable. Today we see an accelerating rise in organic farming and ranching as the clean energy economy eclipses oil and gas. The economic advantages of cleantech are bolstered by political initiatives such as Fort Collins’ Climate Economy, Boulder and Pueblo’s commitment to 100% clean energy by 2030, and Denver’s sustainability initiatives. The real economy now rising in Colorado is far more a part of an economy in service to life than our history suggests. The Denver–Boulder Hub will play a key role in telling the story of a new economy, one that places well-being for all at its center. The Hub will amplify leadership efforts already underway, and create a space where ideas are explored and developed in community. With success stories, the Hub will spread awareness that regenerative economics is not just possible, it is happening. As a center for information sharing and education, the hub provides a place where interested leaders can learn how to accelerate regenerative design and development. It is an incubator for the regenerative evolution of the Denver–Boulder region, and joins the Regenerative Communities Network to participate in a growing collaborative of shared learning.